This December my goal is to worry a lot less about how Christmas looks, and more about how Christmas feels (I am so easily distracted by pretty). 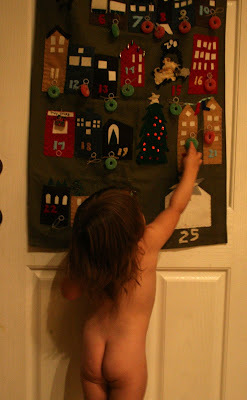 And if that means that I let my naked toddler eat the candy off the advent calendar bottom two rows on day 5, so be it. "Like wishing for the fancy images in the women's magazines [or beautiful websites], we often look in all the wrong places for that elusive something that will finally make our life complete. If we make Jesus Christ our dearest friend, we don't have to search any longer. That first Christmas night long ago had a simple cast of characters - a mother, a father, a child. Yet there is nothing in the entire world that can surpass the mission of that tiny babe born on that holy night. Jesus triumphed over sin and death, and because of those gifts we can face anything that comes our way with faith and hope. A picture-perfect Christmas is a tinsel illusion. Coming to Christ creates a rich reality." Isn't that lovely? Just the re-focus that I needed. I hope you have a great day. Merry Christmas! For me it means letting my children decorate the tree how they like and not how I prefer. Colored chaser lights it is. Maybe one year I'll get a tree with pretty white lights. But I'm guessing that won't happen til they all leave home. Amen. Just exactly the refocus that I need too. I've been feeling the stress mounting, but I think I'm now going to let some things go. i'm trying to be present for all of the season's little moments. this is such a good reminder! thanks, lynne. That is such a beautiful quote. I just love it. Thank you Lynne. Just what I needed too. I think I'll read it every day until Christmas. And maybe I'll even photocopy it and tuck a copy of it into each pocket of my advent calendar!! oh, and love the photo!! So glad I saw this. Thanks for posting! Well yes, it is certainly lovely, but frankly, I am distracted by the cuteness of that little clenched bottom. Gorgeous. Beautiful message! LOVE the photo too! :D Merry Christmas to you and your family!! !